The UCSC Genome Browser is capable of displaying both the BAM and CRAM file formats. While BAM files contain all sequence data within a file, CRAM files are smaller by taking advantage of an additional external "reference sequence" file. This file is needed to both compress and decompress the read information. Since CRAM files are more dense than BAM files, many groups are switching to the CRAM format to save disk space. For CRAM tracks to load there is an expectation that the checksum of the reference sequence used to create the CRAM will be in the CRAM header. A file with a matching checksum is also expected to be accessible from the EBI CRAM reference registry (see References for CRAM resources). Otherwise, users must specify a refUrl setting that will point to a server that is offering up the reference sequences (see Example Four). Since the loading of CRAM data requires the specific reference sequence used to create the CRAM file, it is very important that the exact same reference sequence is used for compression and decompression. When a CRAM file is first loaded on a given chromosome, a check for the preexistence in a special browser "cramCache" directory of the specified reference checksum will take place. If the reference sequence information specific for that CRAM for the currently viewed chromosome region does not exist, a message will display about the file not being found along with a note about downloading the reference from the EBI CRAM reference registry if it is available (or from the specified refUrl). A refresh of the page once the download is complete will display the CRAM data as if it were a BAM file. The track lines to describe CRAM tracks are identical to track lines for BAM tracks. This includes the type parameter, which is still bam even for CRAM tracks. The only difference is that instead of providing the URL to a BAM file, the URL instead points to a CRAM file. Please also note that just as a BAM file requires an associated BAM.bai index file, a CRAM file will require an associated CRAM.crai index file in the same location to load. Please note at the above URL location there is also a http://genome.ucsc.edu/goldenPath/help/examples/cramExample.cram.crai file. If the URL to a CRAM file ends with .cram, you can paste the URL directly into the custom track management page, click submit and view it in the Browser. The track name will then be the name of the file. If you want to configure the track name and descriptions, you will need to create a track line, as shown in the above example. Learn more about track line options and configuring custom tracks here. You can see by adding the above link the Browser automatically assigns the type=bam and the track name=HG00096.mapped.ILLUMINA.bwa.GBR.exome.20120522.bam to the created track to browse. 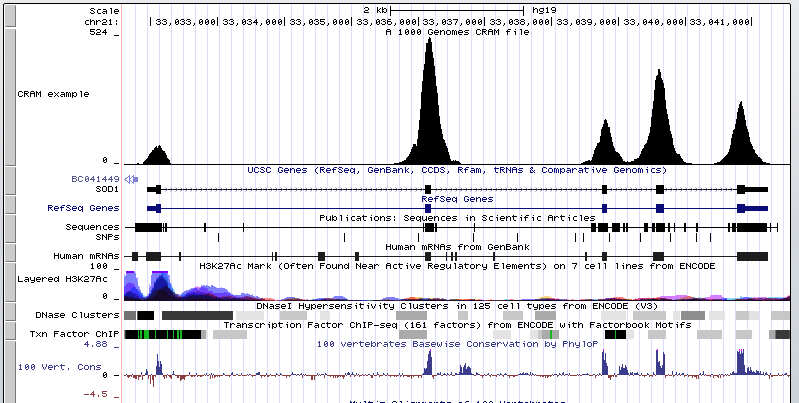 Clicking the following image will load a CRAM file from the 1000 Genomes Project. This CRAM display takes advantage of using the new "density graph" feature where the bam.cram reads are displayed as a bar graph by checking the box next to "Display data as a density graph" on the Custom Track Settings page. The CRAM format is also supported in track hubs. Below is an example trackDb.txt stanza that would display a CRAM files from the 1000 Genomes Project. To learn more about using Track Hubs see the User Guide and associated Quick Start Guides to building hubs. Note that type bam is used to display CRAM files in hubs, just as type bam is used in custom CRAM tracks. Dave Tang blog post about "BAM to CRAM"
If you would like to share your CRAM data track with a colleague, learn how to create a URL by looking at Example 11 on this page. To find documentation on how to set up CRAM support on a mirror of the UCSC Genome Browser please see this following README.cram file.